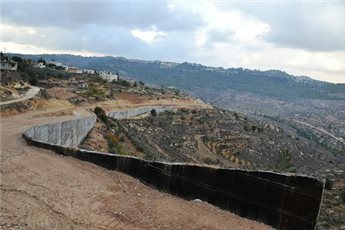 The Cremisan Valley in Beit Jala is under threat from construction of Israel's separation wall. 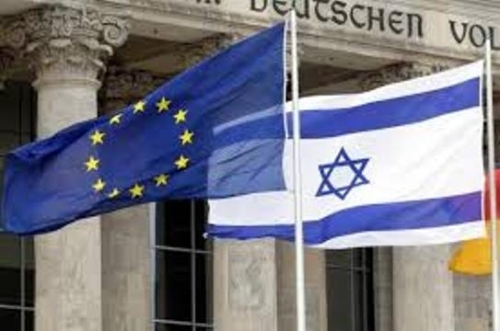 The European Union on Friday expressed concern about the ongoing construction of Israel's separation wall in the Bethlehem area. 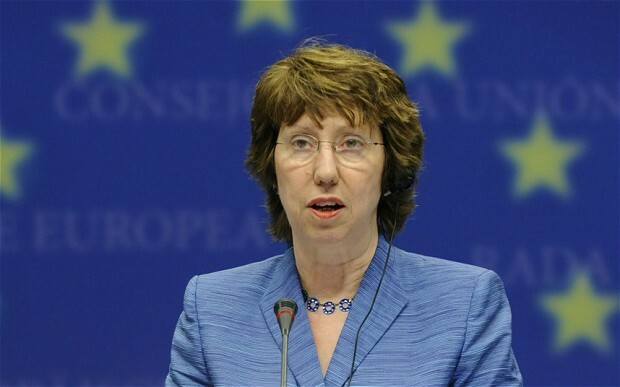 "The EU missions in Jerusalem and Ramallah are concerned by the construction of the Separation Barrier, east of the Green Line, in the Cremisan Valley (Beit Jala)," a statement read. "When completed along the planned route, the barrier will separate 58 families from their agricultural land and children from their school at the Salesian convent, as well as affect the religious site of the Cremisan Monastery." 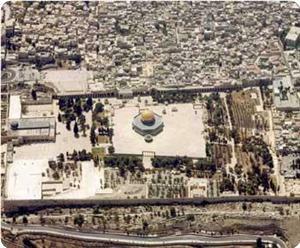 Hanna Issa, secretary-general of the Islamic Christian committee to support Jerusalem and holy sites considered that Israeli settlement activity in the occupied territories, including Jerusalem, represents a flagrant violation of international conventions. He said in a statement that all the Israeli settlements in the occupied territories, under the international law, are contrary to all international principles and the Fourth Geneva Convention of 1949. Issa added that "many of the international legitimacy resolutions confirm that building and expanding settlements are illegal, and demand dismantling the settlements, including those built in Jerusalem, as the settlement construction affects the rights of the Palestinians according to the international law." Professor of International Law Hanna Issa reiterates: "the settlements are illegal under the international humanitarian law." 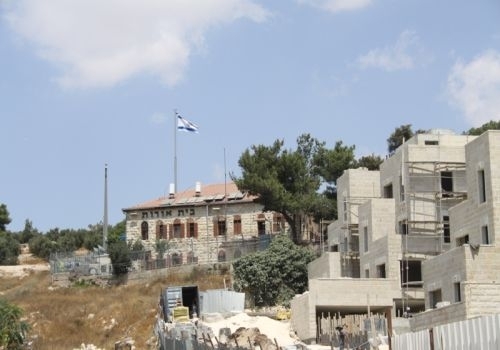 Head of Municipality of Elkana settlement located near Nablus Tzadok Zehorai asked the Israeli prime minister Benjamin Netanyahu to approve the construction of 283 new housing units in the settlement in response to the killing of Israeli soldiers. The Israeli Maariv newspaper reported that Zehorai said that a response to the killing of Israeli soldiers is a must, believing that to intensify settlement activities in the occupied West Bank is the best answer to such incidents. The official added that “if the prime minister approved settlement construction, it would be a strong response to the killings and would stress that Jewish blood cannot go in vain. Local sources in Salfit district, in the central part of the West Bank, have reported that Israeli bulldozers uprooted Palestinians lands, west of Salfit, in preparation for building new units in Leshim illegal settlement. The lands are located between Deir Ballout and Kufr Ad-Deek towns. Leshim was built last year on privately owned Palestinian lands. 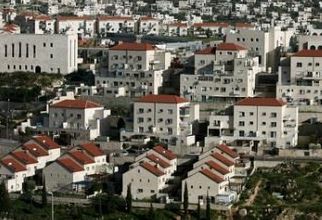 Israeli Housing Minister, Uri Ariel, placed the corner stone of the illegal settlement. The Salfit district is one of the most impacted districts due to Israel’s illegal settlement activities as it contains 23 Israeli settlements swallowing more than half of Salfit’s farmlands. It is worth mentioning that there are 18 Palestinian towns and villages in the Salfit District. Besides being illegal under International Law and the Fourth Geneva Convention, settlements are consuming large areas of Palestinians orchards and fertile lands, and are devastating the Palestinian economy. 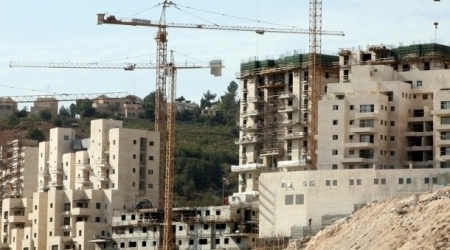 The National Center for Studies and Documentation, run by the Palestinian Liberation Organization (PLO), issued a study revealing that Israel prepared a plan for constructing 3800 units for Jewish settlers in the occupied West Bank, and in occupied East Jerusalem. The center said that the month of August witnessed a serious escalation in Israel’s illegal settlement activities in the occupied territories. 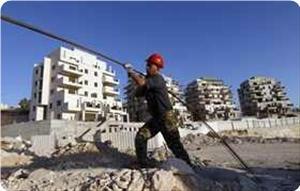 It added that Israel licensed 63 new constructions in Jerusalem, and issued bids for the construction of 1200 in the occupied city. 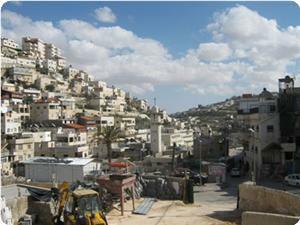 Israel also prepared another plan for building 396 units on Palestinian lands in Beit Hanina, north of East Jerusalem. 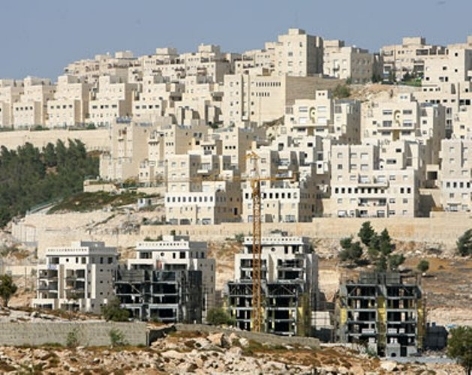 Furthermore, the Jerusalem City Council also approved 1500 units near Shu’fat town, north of occupied Jerusalem, while the Higher Construction and Planning Committee of the Israeli “Civil Administration Office" in the West Bank, approved the construction of 878 units near Ramallah and other areas in the West Bank. Israel also approved the construction of 230 units in Maon settlement, east of Yatta, in the southern West Bank city of Hebron. Last week, the Norwegian Ministry of Finance revoked the exclusion of the firm Africa Israel Investments Ltd. and its subsidiary Danya Cebus Ltd. from the Norway state pension fund based on Africa Israel’s claim that it is no longer involved in the building of Israeli settlements in the West Bank. 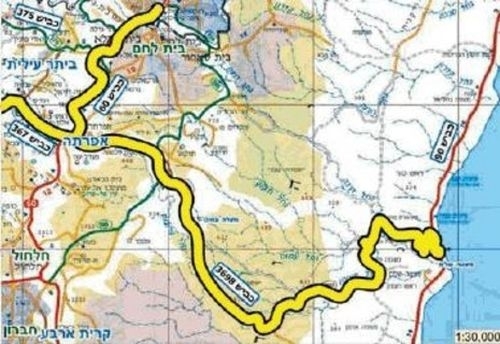 However, The Electronic Intifada has obtained new evidence of Africa Israel’s ongoing involvement in the construction of housing units in the settlement of Gilo in occupied East Jerusalem. In 2010, the Norway excluded Africa Israel Investments Ltd. and Danya Cebus Ltd. from the state pension fund due to the companies’ involvement in the construction of Israeli settlements, illegal under international law, in the occupied West Bank. The Council on Ethics, an advisory body to the Ministry of Finance, routinely reviews if the basis for the exclusion of a company is still present. “When this involvement [in settlement construction] ended, the Council on Ethics recommended in 2013 that the exclusions of [Africa Israel and Danya Cebus] should be revoked. The Ministry of Finance decided to follow these recommendations,” the ministry wrote in a 29 August email to me. However, occupation profiteer watchdog Who Profits wrote in a 28 August email to me that Africa Israel’s subsidiary Danya Cebus is still involved in the construction of the C-Jerusalem housing project in the settlement of Gilo, in the occupied West Bank. The C-Jerusalem project includes 121 housing units and is located at the crossing of Tsviya ve-Yitzhak Street and Yeffe Rom Street in land occupied by Israel in June 1967. The video taken by Ta’ayush on the Gilo construction site on 28 August 2013, shows a Danya Cebus flag as well as a white andyellow sign with the Danya Cebus logo and the name Africa Israel. 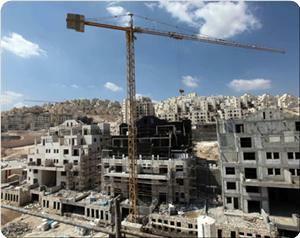 In addition, this week, Who Profits also obtained information from the sales office at the C-Jerusalem project site. 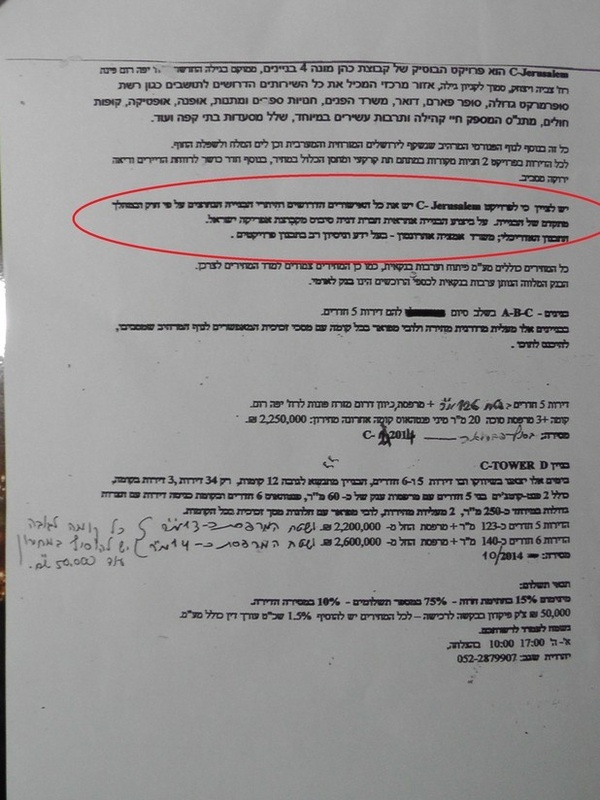 It includes a document signed by Yehudit Segev, a marketing representative of the project, which states (translated from Hebrew): It should be mentioned that C-Jerusalem project has all the necessary approvals and construction permits required by law and that it is in an advanced stage of construction. Danya Cebus Company from Africa Israel Group is in charge on the execution of the construction. 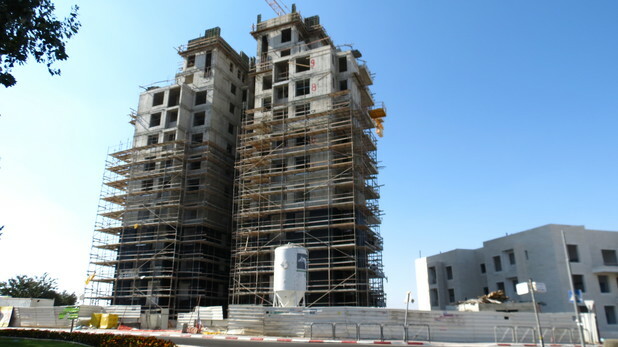 Who Profits further writes in its 28 August email that in May 2012 the marketing representative for the housing project expected the last building of the C-Jerusalem project in Gilo to be ready in May 2014. Meanwhile, the Jerusalem based Judith Ben Avi Real Estate Company has put the first apartments on the market. 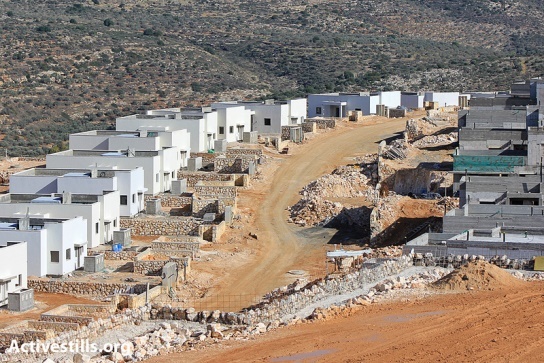 It is disturbing that Africa Israel has not mentioned its involvement in the construction of housing units in the settlement neighborhood of Gilo to the Council on Ethics. The company further has not unequivocally expressed that it will abstain from any settlement construction in the occupied Palestinian territories or the occupied Golan Heights, which belong to Syria. The Council on Ethics should reconsider its position because of Africa Israel’s ongoing involvement in Israel’s settlement construction in East Jerusalem, occupied West Bank. In its advice [PDF] to the Ministry of Finance, the council states it has not changed its position about the illegality of Israel’s construction of settlements in the West Bank. It remains of the view that involvement in such activities can constitute a basis for the exclusion of companies from the Norwegian state pension fund. Member of the Palestinian Legislative Council and head of the Palestinian National Initiative Movement, Dr. Mustafa al-Barghouthi, said that the Israeli occupation authority uses the negotiations to cover for its expansionist policy on Palestinian lands. Barghouthi said during a meeting with a British delegation on Friday that the number of Jewish settlers rose from 150,000 when the Oslo accord was signed to 560,000 now, which proves the Israeli occupation seeks to buy time to impose facts on the ground and to complete its expansionist plans. Barghouthi stressed the importance of ending the Palestinian division and regaining national unity to confront the dangers facing the Palestinian national project.